Halo Pave Set Diamond Split Shank Wedding Set | Shane Co.
Hand-matched for exceptional fire and consistent sparkle, 57 round pavé-set diamonds, at approximately .40 carat total weight, give this design timeless elegance. These exquisite gems create an attractive halo wedding set which is crafted from superior quality 14 karat white gold. 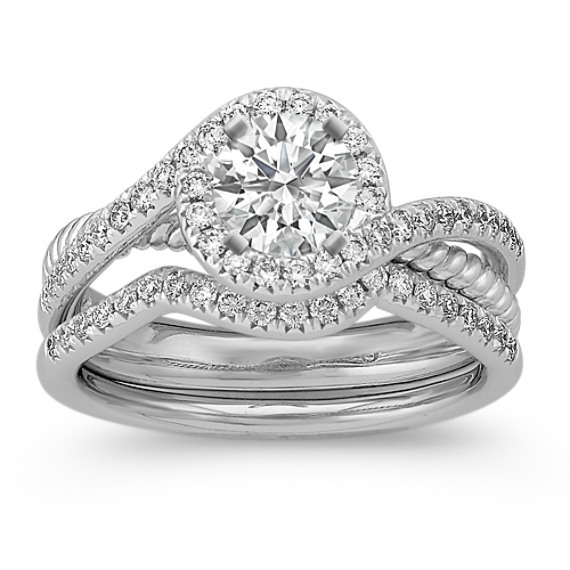 The split shank design is made to hold a center stone at approximately 1.00 carat.